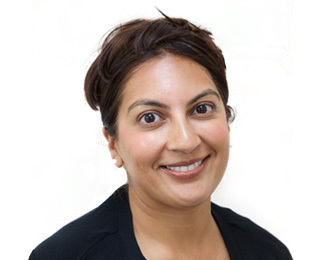 Sonal qualified from the University of Manchester in 1996 and worked as an associate in North West London before joining Blue Court Dental Centre in 2004. She enjoys all aspects of general dentistry and the variety of work it offers. She enjoys building a lasting relationship with her patients and consequently has a loyal patient base that travel from far and wide to see her. During a patient's journey with Sonal, their needs and concerns come first at all times. Patients love Sonal for her ability to put them at ease with her gentle, caring and approachable nature. Her nurturing manner endears her to patients of all ages, in particular to children. As a dental surgeon, she is committed to post-graduate study, regularly attending seminars and courses. Sonal subscribes to numerous dental journals and studies them in order to be up-to-date on the latest technologies and techniques. Sonal is passionate about facial aesthetics. With a repertoire of aesthetic qualifications in Botulinum Toxin, dermal fillers, medical skin peels, Dermaroller and cosmeceutical skin care, she has also trained with renowned and highly respected UK experts within the field. She keeps her treatment knowledge up-to-date by regularly attending courses and lectures. She takes the time to fully explain treatments to patients and answer any questions you may have about these safe and trusted facial aesthetics treatments. Outside of work, Sonal enjoys spending time with her family. When I first came to the dentist in 2005, I was very frightened of the whole experience due to not having the best times in the "chair" as a child. Now 6 years on, I look forward to a trip to the Blue Court Dental Centre due to the welcoming environment and the lovely staff. As always, it has been a joy to attend as a patient. Thank you Sonal. I have dental phobia and my dentist Sonal is excellent. She really makes me feel relaxed. Dentists are good. My dentist helped my tooth feel better. Thank you Dr Patel.